How many bit boxes do you own? If you’re like me I’m sure you have at least two or three around the shop at any one time. The one we are going to look at today is the Max Impact Bit Set from DeWalt. 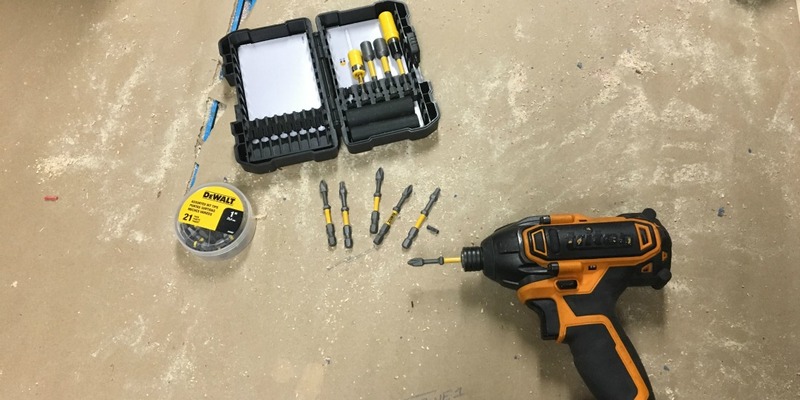 It’s built around the idea that impact drivers are really beating the crap out of the bits these days and a good solid bit set meant for abuse has it’s place in the market. The bit set includes 6 bits that are quite long at 2.5” and claim to have a “dual torsion zone which transfers optimal torque for impact driving.” Although this statement sounds really well, there is no real easy way measure just how much better this bit set does it compared to the next. The dual zones can be seen on either ends of the bit and are separated by a small hex shape. From a weight stand point, I can see the advantage. I am however a fan of the two different bit sleeves included in the set. They both have a real gnarly neodymium magnets imbedded into the base of the sleeve that hold a bit and screws in really well. Have you ever been working in the heat of the day driving in something like sheet metal screws and the bit keeps sticking to the screw when your done driving it??? It is beyond maddening when you’re really trying to move along. The magnets keep everything nice and planted together. This set includes a small plastic dish with assorted flats, phillips, torques, and square bits that measure 1” long. They are loosely kept in the small dish, and the dish sleeps in the case….or so it should go. When the small dish is in the bit box, it won’t close all the way and requires a bit of compression to close it and set the slide lock. I’m not real sure how the guys in the box division missed that one but it would seem pretty trivial that the box will need to close all the way with the small dish inside of it. All the bits are held in place using the same method as all the other bit boxes of this type which is another area that I think could be improved. Getting the bits out is not such a chore but putting them in can be a bear. The bit needs to be lined to its little nest from the end of the slot and slid into position. The ideal nest would be a kind of snap fit capture in my opinion that had a snug little break over point. Basically you would press, press, press, and then finally the bit would “snap” into its little home. The set comes with 2 impact rated sockets; a ½” and a 3/8” and both are 3/8” drive. Those two sockets can easily adapt to the 3/8” drive impact driver bit. This is one particular bit I have a load of experience with and continue to love it more and more. These days , I find myself reaching for the 3/8” driver bit when the sockets come out instead of the ratchet. The time savings with a stout impact driver is amazing! When you consider the individual bit themselves, I think this is a great combo kit for less that 35 bucks. The box on the other hand really needs some more volume to it. There are other boxes in the DeWalt line up that are just slightly bigger than this one, which would have worked great for keeping that additional dish I mentioned earlier. Thanks for dropping in to learn a bit more about this product. If you’d like to learn more about them on the home depot website, feel free to check them out here.